What does that even mean, history writ aright? Aside from it being a quotation from a speech I recently read, I mean. It’s a question I’ve wondered about, and worried about, as we’ve all debated here in Charlottesville, in Virginia, and across the country about what to do with Confederate monuments. 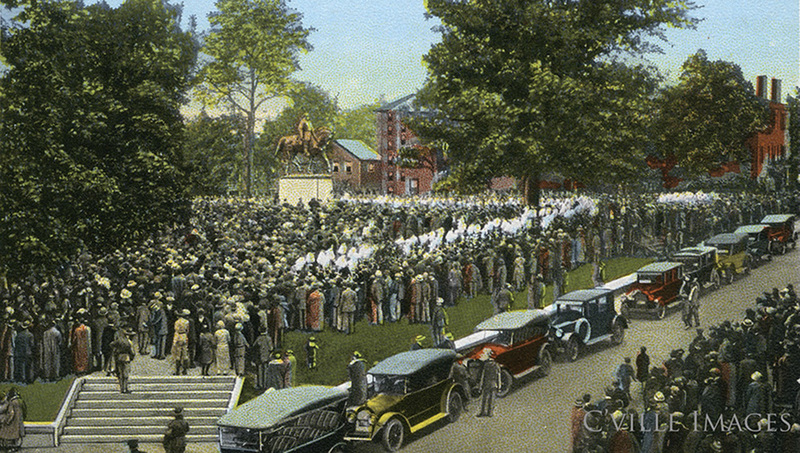 Now, with the KKK planning a trip to Charlottesville later this week and after them the alt-right, I thought it was worth doing a deep dive into the history of the Robert E. Lee statue in Charlottesville. The essay places readers in the moment of its unveiling in 1924, then flashes forward and back in order to provide important context for today’s controversies. You’ll find a bunch of relevant links to Encyclopedia Virginia entries and primary sources, as well as a few embedded virtual tours—including a new one of Lee (now Emancipation) Park itself. It’s worth asking ourselves, as the essay does, what it means that we seem to have separate histories. That so much of the debate has boiled down to my facts, my history, my experiences. In the meantime, here are a few VFH resources that might help you explore these issues. What’s “Monumental”? A Richmond man makes a case for rethinking the city’s monuments. War Memorials: Who Controls the Past? Who decides how to commemorate sites of wars and other horrific events? Check it all out and, as always, let us know what you think. It’s the city’s park, and the city’s statue. They have the right to take it down, just as they had the right to put it up. Everyone else should just go home and mind their own business. Dennis, I like it and will save this quote.